Summer Skin, Autumn Nudes and Olay’s new CC Cream! Recently I’ve been experimenting with darker, more autumnal neutrals in my makeup looks. Sometimes they work, sometimes I end up wiping off lipstick and toning down my eyeshadow as I hurtle into town on the tube, but I’m enjoying the process at any rate. After months of being stuck inside doing my dissertation (ah, how long ago it seems already!) it’s nice to be able to poke around in the new season cosmetic collections and spend a few hours trying things out! This week’s video is a summer-into-autumn kind of look: the natural, fresh skin is quite summery but the lips and eyes are a bit more sultry and serious. The sheer, glowy skin is courtesy of Olay’s new Total Effects CC Cream (sponsors of this post and video) and the eyes and lips showcase a few bits and pieces that are limited edition for autumn winter – I’ve detailed all of the shade names and provided links at the bottom of the page. CC Creams. I know there’s some confusion over these (and BB Creams) and I promise that my explanatory video will be with you soon – week after next, with any luck! But as an incredibly general rule, BB and CC creams combine cosmetic coverage (a little less than you’d get from a foundation, though formulas vary wildly between brands) with some of the benefits that you’d expect from your skincare. So a good SPF (so long as its applied generously, see this video) and perhaps moisturising ingredients, antioxidant ingredients or ingredients that help to address specific skin concerns such as pigmentation or fine lines. Personally, I’ve always been less concerned about products’ names and more interested in what they do. A good BB or CC cream (and indeed, a good tinted moisturiser!) is all about convenience. If I want to just apply one product over my serum (I often don’t need that extra layer of moisturiser) then the BB/CC/TM does the trick for me. I can use it in hugely generous quantities (coverage is sheerer therefore no real blending needed and the product never looks cakey or overdone) and get my SPF ticked off, my moisturiser ticked off and my hint of dewy, healthy colour. If I’m “off duty” then I’ll rarely use foundation – just an all-in-one and then a bit of concealer on dark circles and any spots if I need it. I hope that’s helpful – I’ll recap and go into more detail and also show a few examples of what I mean when I do the video in a couple of weeks! So, Olay’s Total Effects CC Cream. I’ve been using this over the summer as a light, juicy base. I know I’m probably mis-using the word “juicy” but it’s the best description I can think of! The finish isn’t dewy or shimmery in any way, it just feels plumpy and fresh. 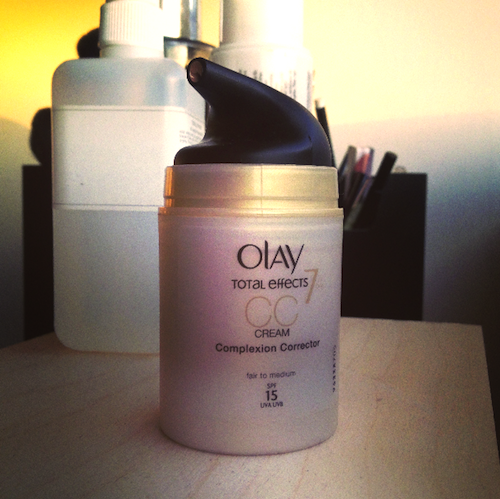 Way back at the start of summer I recommended Olay’s BB Cream (see here) – the CC is like its ‘older sister’. Olay have formulated this one with 50% more of their ‘anti-ageing complex’ which includes antioxidants, a good broad spectrum SPF (UVA and UVB protection) and my little skincare hero, niacinamide. I like that there’s a very sound base to this – something that’s properly helping with moisturisation, protection and correction of uneven-ness – as well as natural-looking coverage. Double-whammy with helping to correct skintone, as you have it on a superficial, cosmetic level and then something a little more long-term with the skincare. There’s also a nice helping hand with moisture levels thanks to the niacinamide (helps to strengthen the skin’s moisture barrier) and ProVitamin B5, and antioxidant benefits are provided by vitamins E and C.
Previous Post Jimmy Choo: Unapologetic Eyewear.